Housley: Should he stay or should he go? As you may have noticed, the Sabres again have finished last in the overall standings. It was a season that came without warning. Buffalo was in last place back in 2013-14 and 2014-15, but had shown improvement since those bottom-feeding years. With a new general manager (Jason Botterill) and coach (Phil Housley) in place, hopes were high. The fact that expectations for further steps forward were dashed so quickly and so emphatically made this arguably one of the most disappointing seasons in franchise history. Now comes the tough part: What do the Sabres do next? 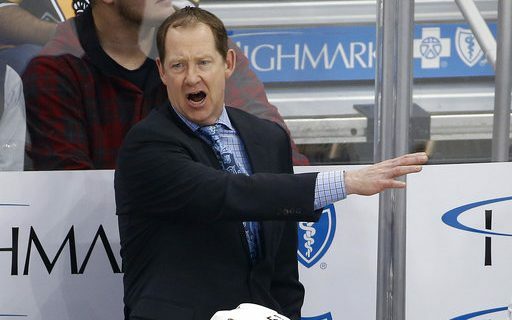 The first question has to be: Does Housley keep his job for next season? We’ll assume Botterill isn’t going anywhere, since one year is hardly time for a new general manager to rebuild an organization. That leaves Housley as the starting point for discussion. Let’s review the situation. Let’s face it – Toe Blake, Scotty Bowman or Mike Babcock couldn’t do much with the players that Housley had at his disposal. The team turned over half of its roster in 2017-18, and it didn’t seem to help. The Sabres tried everything, including bringing up players from Rochester every so often, watching them fail to contribute consistently, and sending them back to the minors. Tissues had more longevity at times. Speaking of the roster, it was economically inefficient. Players such as Kyle Okposo, Jason Pominville, Matt Moulson and possibly Ryan O’Reilly, who all earned at least $5 million per season – did not have years that warranted such big paychecks. Such inefficiencies are somewhat inevitable in a salary cap world; young players are usually underpaid for their production while older players are paid for previous production. It’s also important to note that this new management team had little to do with most of those contracts but had to deal with them as they put together the roster. They gave Botterill less wiggle room to help Housley after the bad start. Would a coaching change help much technically? I tend to think that, unless there are underlying circumstances, most teams have roughly the same amount of coaching smarts on a staff. Maybe an assistant coach who is particularly good at an aspect of the game might become available to the Sabres, and that could lead to a switch. But there aren’t many secrets out there. Injuries didn’t help Housley’s cause. The Sabres were one of the league leaders in man-games lost to injuries. The long-term losses of Zach Bogosian and Jake McCabe made a thin defense thinner. Jack Eichel didn’t reach 70 games played for the season due to a bad ankle sprain. Contracts play a role in the story. Buffalo already is paying Dan Bylsma not to coach, and will do so for two more years. I couldn’t find a mention in news archives of how long Housley’s contract to coach the team is. But if it was for more than a one-year deal, that means the Sabres would be paying two coaches not to coach and one coach to coach if they made a move. That’s not exactly an ideal situation. And if someone was good enough to be hired a year ago for his first head coaching job, isn’t there something of a learning curve? You don’t turn stupid overnight, but you can learn a lot in the first year of a new job. Colorado dropped 34 points in the standings in the 2016-17 season, but improved 45 points in 2017-18 and made the playoffs. Those teams had the same coach, Jared Bednar. It was an awful year in many different ways, and head coaches usually take the blame when such seasons take place. The Sabres finished with 62 points this season after a compiling a 25-45-12 record. That’s a 20-point drop from last season, when Buffalo went 33-37-12 for 82 points. If Bylsma had hung around and turned in the same season in 2017-18, he probably would have expected to be shown the door. If you throw out the two “tank” seasons, the team hadn’t had a winning percentage under .400 since 1971-72, when it was a second-year expansion franchise. Buffalo’s finish didn’t earn Housley any brownie points. The Sabres closed with a four-game losing streak, going 2-9 in their last 11. Yes, the team was playing a lot of young players for a variety of reasons, and some injuries in goal didn’t help either. But the team finally appeared to exhale near the end of a difficult season. I’m not sure it was avoidable, but the players didn’t look too motivated at the prospect of avoiding a last-place finish. What’s more, the Sabres were not only bad this past season, but they were boring. Buffalo was the only team in the league not to score 200 goals (they made it to 199 on the season’s final night). The team had too many nights where it simply didn’t show up. And you may have noticed that the Sabres were particularly bad at home. They finished with an 11-25-5 record in home games, which includes one game played in New York City (Winter Classic). When was the last time a Sabre team lost 25 games at home? Never. The old record was 22, in 2014-15. That 1971-72 team also won 11 home games (the previous franchise low), but ties weren’t broken and it only lost 19 games. This time around, Buffalo put up some all-time stinker performances along the way, including a 7-1 loss to Dallas that was embarrassing for all concerned. The on-ice product didn’t affect the number of tickets sold very much. In 2016-17, the Sabres’ averaged announced attendance in the KeyBank Center was 18,141. A year later, the number fell to 17,982 (the Citi Field “home game” in New York – 41,821 – is not included in that total). But no-shows seemed to be up dramatically, and the secondary ticket market collapsed to the point where tickets could be purchased through third parties for $6. Western New York loves its hockey, but we’ll have to see how much this season affected that relationship when renewal time for season-ticket holders comes. Most organizations do extensive evaluations as soon as a season ends, and the Sabres plan to follow that path. I suspect that when Botterill addresses the media on Wednesday, that thought will be expressed. I would think the coaching staff will be included in such a sweeping statement, although Housley may get the proverbial vote of confidence in the process. We saw the possible future of the Sabres’ franchise in the last few weeks, with names such as Mittelstadt, Nylander, Ullmark and Guhle arriving in Buffalo. You can throw in another top prospect in this summer’s Entry Draft, where the Sabres will pick no lower than fourth. The kids will be given the chance to hang around and be part of the nucleus of future Sabre teams. My guess is that Housley should be and will be given that chance to coach those players, as well as several others who figure to arrive over the summer. But the phrase “short leash” is designed for situations such as this. If the Sabres’ management has a team in November that has started poorly and is being watched by a few thousand empty seats, all presumptions are off. Follow Budd on Twitter @WDX2BB.